I was lucky enough to come across some extra fresh scallops last week. They were sittin pretty, still in their shells, and I swear that I heard one call my name as I walked by the fish counter. It was perfect timing really since I still had a few previously completed French Fridays with Dorie recipes to cross off my list, including Dorie’s Scallops with Caramel-Orange Sauce. As the fish guy was removing the scallops from the shells and cleaning them up for me, he asked if I would like to keep the corals. For those of you who have not seen a whole scallop before, the coral is this plump, handle-shaped bit attached to the main mussel. There seem to be two main reasons why the corals are so often removed: (1) they are highly perishable and, when left intact, cause the scallop to deteriorate more quickly than it would without the coral, and (2) many people do not like the taste. I, for one, find the taste to be quite good and actually, a bit mild, so I asked that they not be removed. 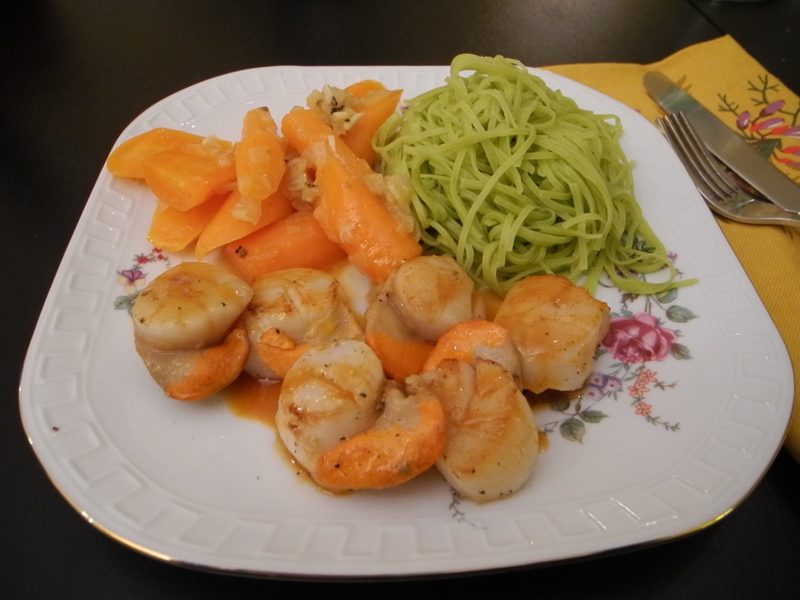 As per Dorie’s suggestion, I paired these scallops with her spiced carrots, and then added a side of spinach linguine sauced with just a bit of butter and fresh thyme. It turned out to be quite a colorful combo on the plate but the flavors all went quite well together. This was an easy and delicious meal and we loved it! This entry was posted in french fridays with dorie and tagged Around my French Table, main course, shellfish. Bookmark the permalink. I had no idea my scallops were missing a piece. Interesting. Soon…soon, I’ll be in a land of fresh seafood. Your dinner looks great! I don’t think I knew that about the scallops. Interesting! They look great – they were definitely in my top 10 favorites from the book so far. I’m glad you tried this scallop dish, definitely one of my favorites and they do look good! I tried the scallops with their corals, they are good, too bad we never see them served this way in US. What a stroke of luck to come across some scallops! These were very delicious, but I love scallops in any form. Great post! I so want to try this, but I have a terrible scallop allergy — weird, right? So, I wanted to try this with shrimp instead, but I fear it won’t have that delicate texture. Ah, well, I may give it a try.